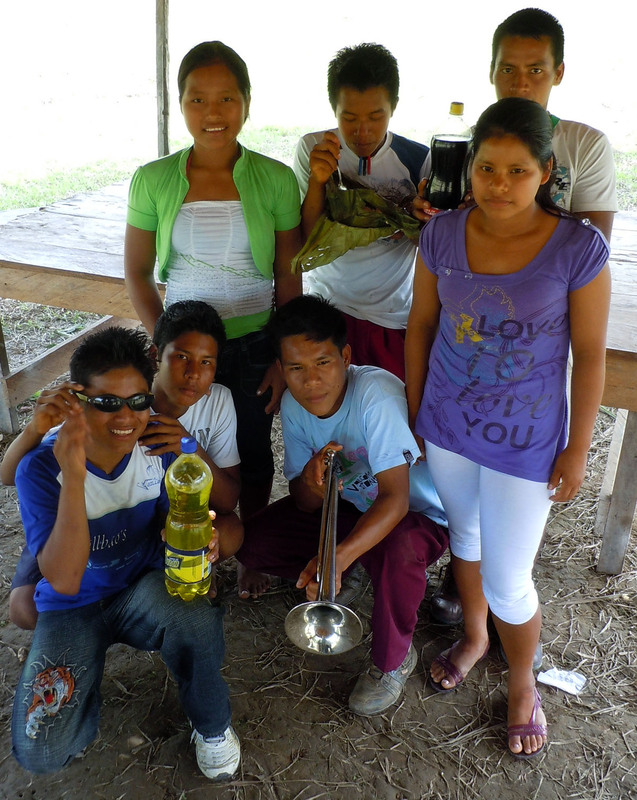 I was originally going to go out with Yully and the copal team for a full day of searching for the resin trees in a new area of forest, but I was both tired and wanted to get photos of as many of the dye plants as possible to accompany our description of crafts in the online store. As ever forthcoming with her willingness to help and equally generous laugh heard clear across a soccer field, Ines offered to show me some plants in her yard and purma. 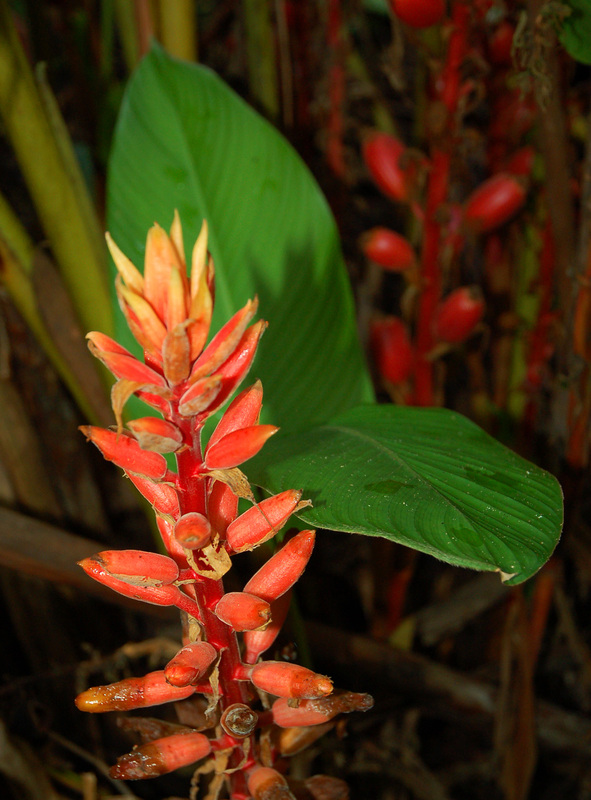 Right next to her house, Ines dug up a few carrot colored rhizomes of a plant in the ginger family called guisador. 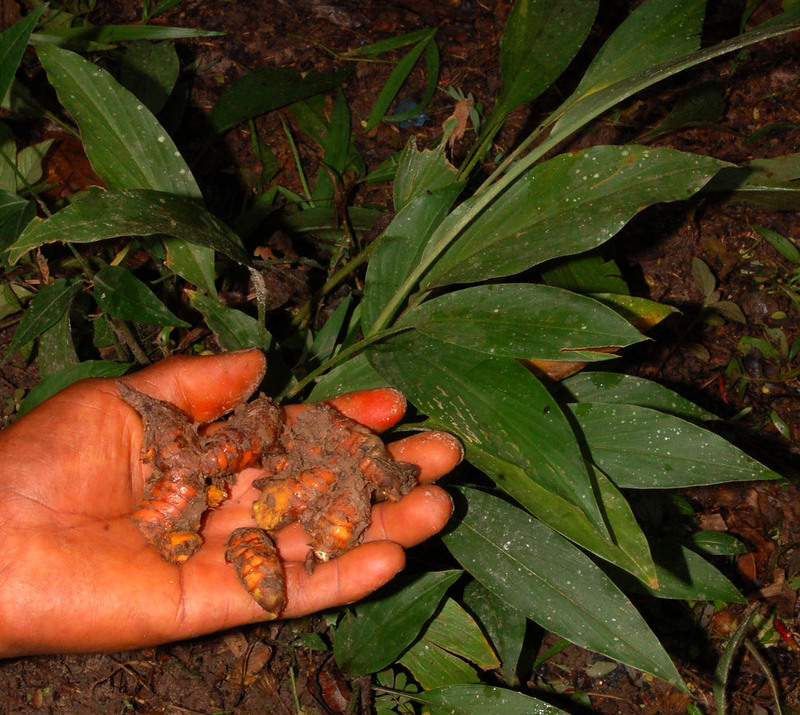 These roots are ground up to dye chambira a pleasing yellow; it’s also used to give the same color and slight ginger flavor to rice. Ten yards away were a few two-foot tall “jangua” plants. Its tiny green kidney-shaped pods immediately identified it as a legume (bean family). 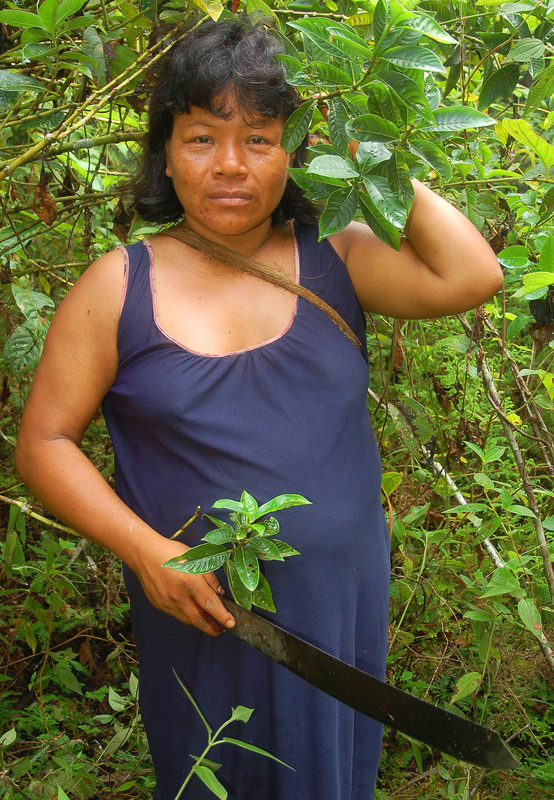 Ines said she needed about a pound of “jangua” leaves to dye one “cogollo” of chambira a dark green. Although these plants had grown quickly in a month, there was not yet anywhere near enough leaves on these small specimens to harvest. This past rainy season was unusually rainy (as the previous dry season was extremely dry) and Ines yard along with almost the entire upper field of the village was flooded. People needed their canoes to go from house to house. This inundation had killed most of the herbaceous plants in Ines’ yard that were not adapted to standing water. While her mature “sisa” vines had survived, the younger plants whose leaves are boiled with chambira to turn the fiber a dark red also succumbed to the high water. New ones were just growing back. 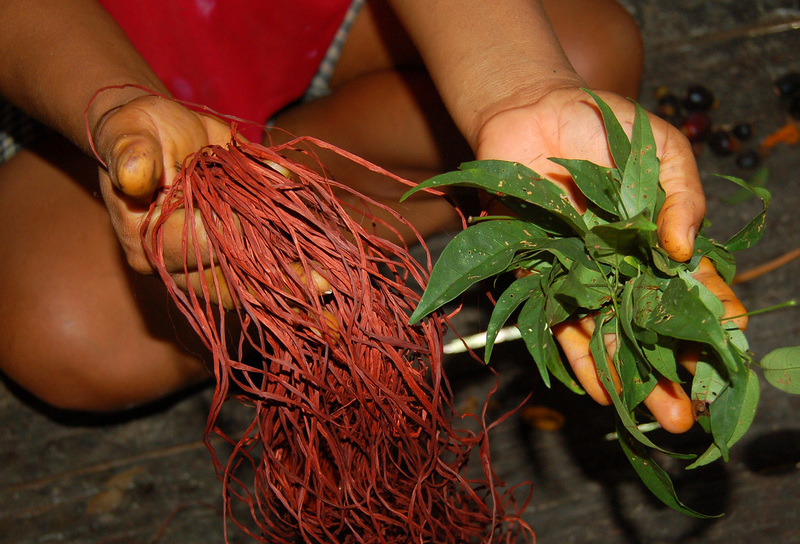 Our dye plant tour next passed on to several small and medium-sized “achiote” trees. Ines broke open a few of the prickly pods of two kinds she had in her yard. 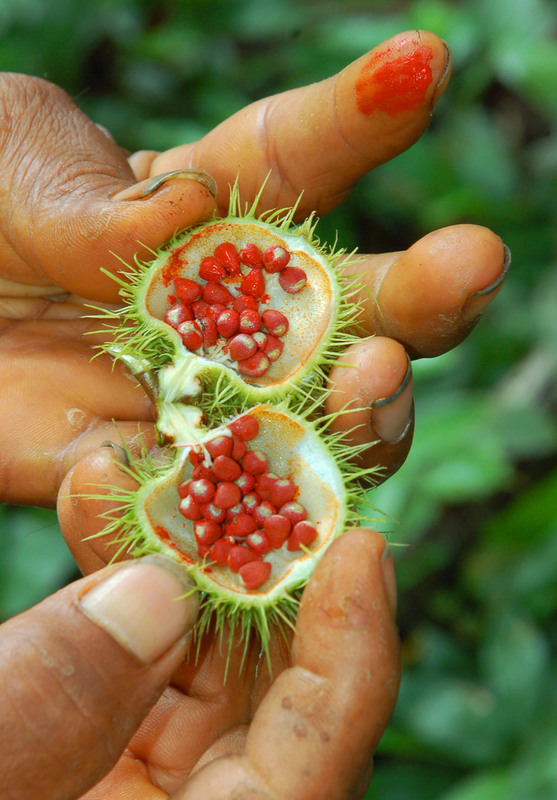 The seeds are coated with an oily red substance that readily transfers to fingers, fiber and food. It’s better known as annatto in western cooking, but it is one of the most common face and body paints among native Amazonians and also turns chambira a beautiful orange-red. 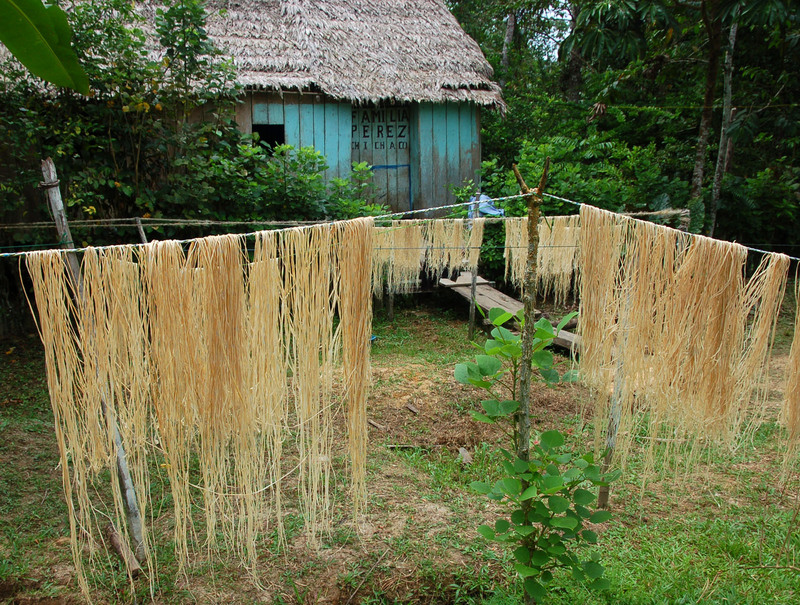 One downside of this plant as a fiber dye is that it tends to lose its color when wet unless fixed with other materials. Ines, her husband Manuel and I then headed off to their recently fallowed purma. En route we passed by a dense patch of a tall herbaceous plant called “mishquipanga.” It has oblong fruits are about the size of a large pecan, but the easily cracked shell of a ripe pod turns one’s fingers a deep wine red. 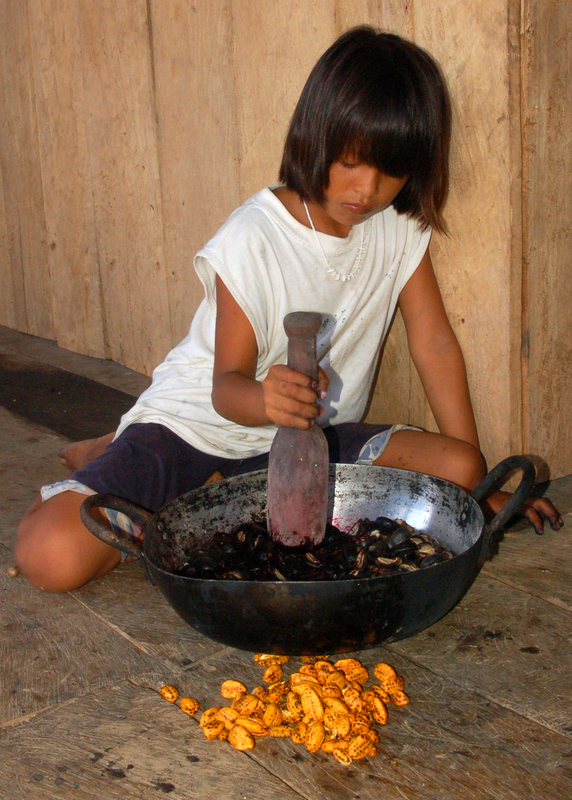 The pumpkin-colored pulp and seeds are discarded, and the shell is crushed and boiled with chambira to turn it a slate blue. Another few hundred yards down the trail led us to a “rifari” tree whose leaves are also boiled with chambira fiber to turn it black. Nearby was a plant that Ines call “huito.” I was first confused, because this is the common name for a tree also called genipapo whose fruit rinds are ground up to produce a dye that turns chambira a dark grey. It’s also used as a body paint throughout the Amazon that turns the skin dark purple to black for several weeks. This “huito” of the purma, however, was different. Ines said it spread more by sprouting than dispersing any fruits. More importantly, it was not used to dye chambira. Its’ leaves are crushed and boiled and applied to people’s hair to heal the scalp (from afflictions such as dandruff and possibly head lice) and turn the hair black. This process needed to be done with some care to avoid dying the person’s face black as well. Looking back at photos of me with Tembé colleagues in the summer of 1996, my hair was still mostly dark brown with a small shock of white. Fifteen years later, it’s now almost entirely silver. I think my family and friends would agree that vanity is not one of my major weaknesses, but I am strongly considering accepting Ines’ to apply this native treatment to my hair since I have not been drawn to an expensive application of chemical dyes in a U.S. salon. Returning to Ines’ house where chambira was drying outside, she showed me the one regular huito tree in her back yard, but even though it had grown to well over fifteen feet, it had not yet borne any fruit. She had planted it from a seed acquired elsewhere, and I didn’t know enough about the tree to know if it was still too young to fruit or was lacking some important biological requirement. Manuel got a long pole and pulled down a long strand of a slender vine called “suelda con suelda.” Its leaves serve as a decent but less common way to dye chambira black when mixed with mud. It’s mostly considered a nuisance plant because it can wrap itself around and envelope a variety of fruit and other useful trees to the point of killing them. 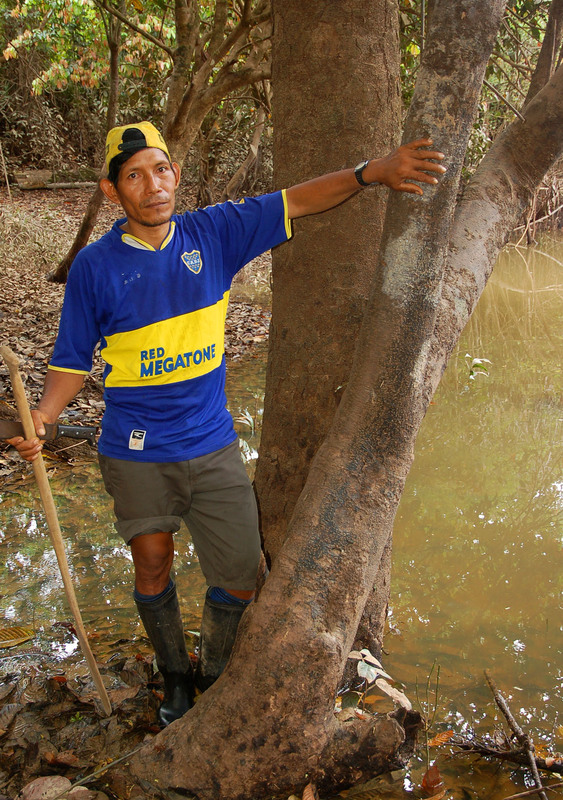 Manuel led us on our final foray down to the river to point out a “huitillo” trunk by the edge of the water. 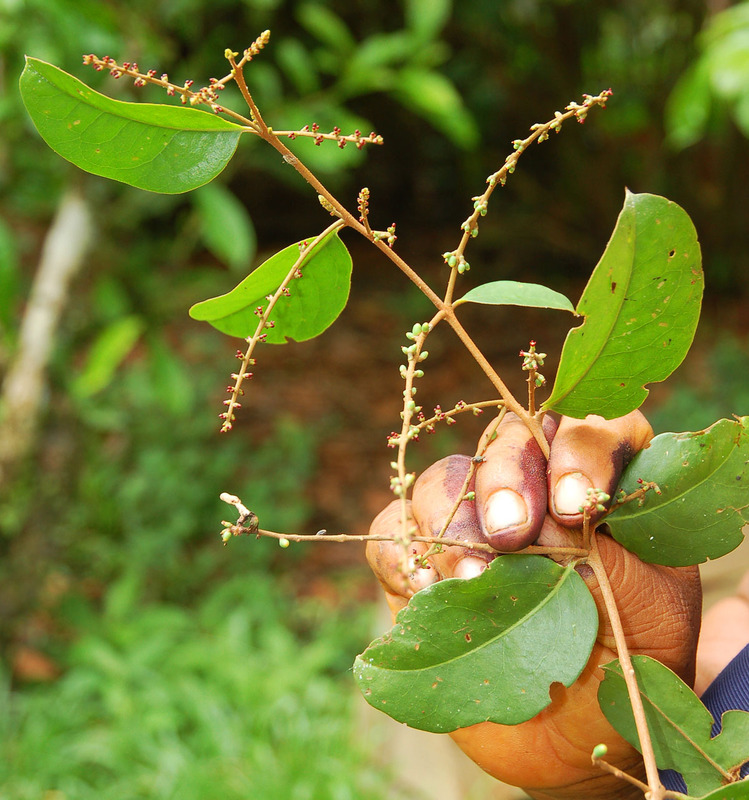 Its fruits are commonly used as another natural dye to turn chambira black. Like some tropical trees, “huitillo” produces a flush of leaves, flowers and fruits in the months leading up to and during the rainy season. Once it has finished its reproductive cycle for the year, it drops all of these. Manuel pointed across the river to many other bare trunks that were all the same species. Since “huitillo” fruits like many other fruits in the region are only available in a certain season, the Bora and other artisans need to have multiple sources for certain colors to make their crafts with a full palette year-round. 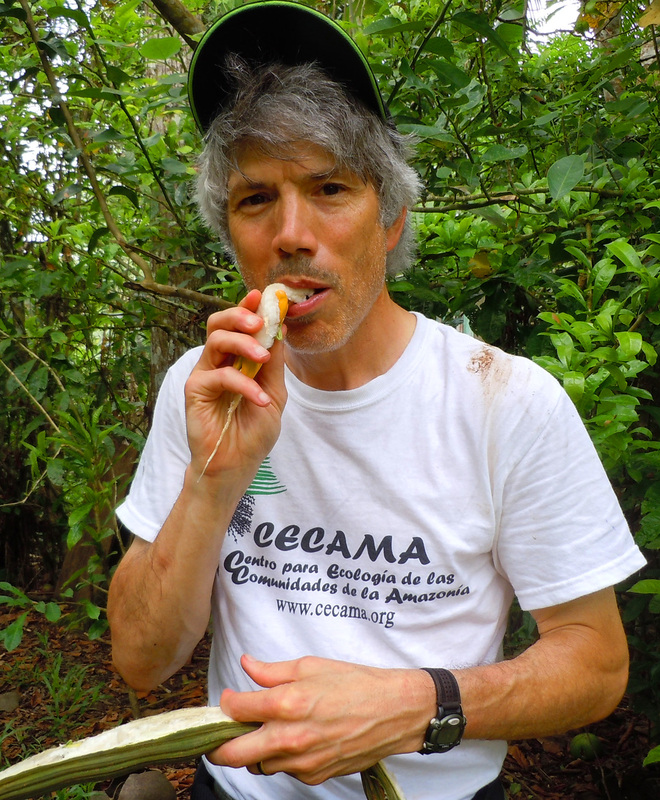 Ines handed me a two-foot long bean pod called “guaba” as a midday snack. 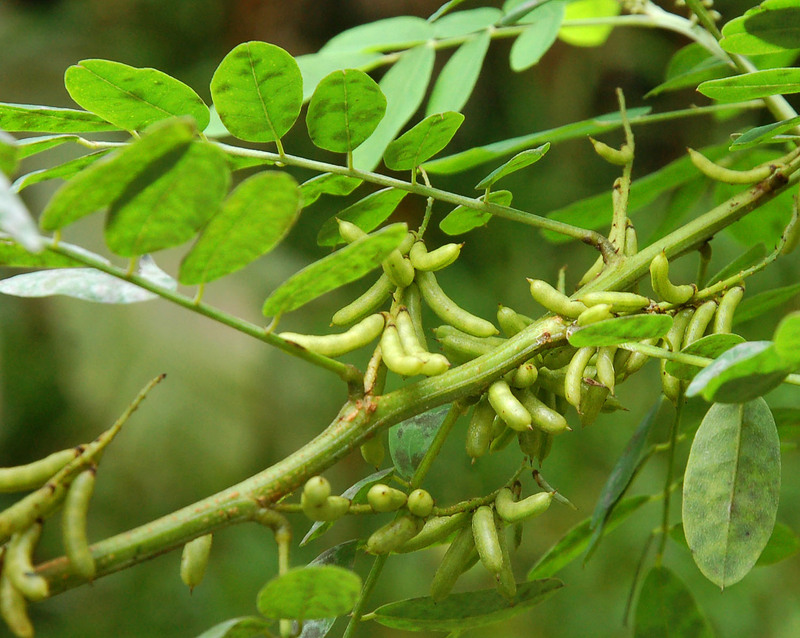 It came from a legume tree also known as “inga” in Brazil. Cracking open the pod along the seam revealed a dozen large kidney shaped seeds surrounded by succulent white flesh. A bit later, I was hoping I could muster the energy to interview artisans who had recently joined our project group, but decided I most wanted to just relax a bit with my book. Before I got far, though, one of the teachers came into the house and asked me if I would serve as a judge in the “juanes” competition for classes in the village school. 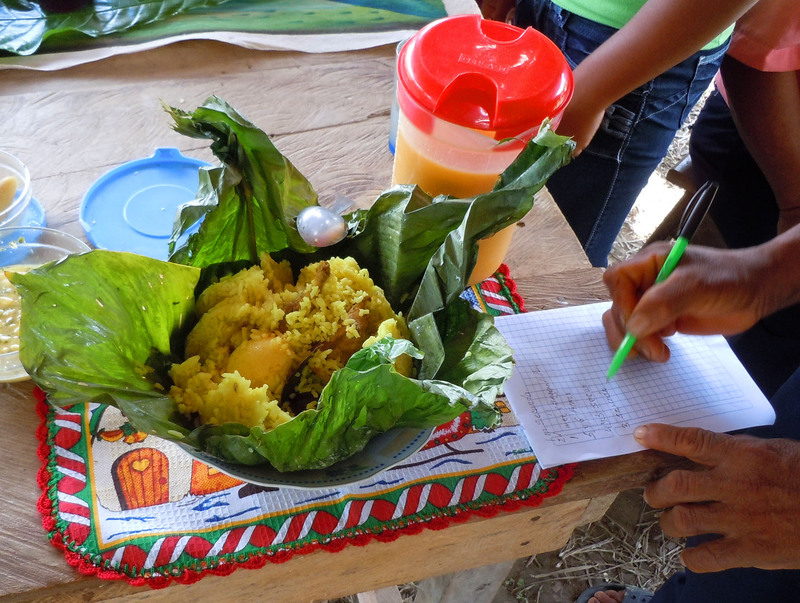 I had a passing acquaintance with this regional dish of Loreto in years past, but got to know it better recently when I asked Yully and Angel to send me some recipes of typical Peruvian food we could serve at our Spirit of the Amazon party. My friend Judy who is a professional cook followed one recipe for the preparation of the rice with chicken, boiled eggs, olives and some spices, but she had to substitute corn leaves typically used for making tamales because banana leaves were nowhere to be found in State College, Pennsylvania. There was certainly no lack of banana leaves in Brillo Nuevo. I made my way to the conical thatched roof open shelter near the edge of the soccer field where every child and teacher in the village had gathered around. The two entries from the primary school and four entries from the secondary school were all laid out on a big table. I was reminded again that Peruvians can turn almost any occasion into a formal one when the convener of the event called for the group to gather in silence and then rise to sing the national anthem. 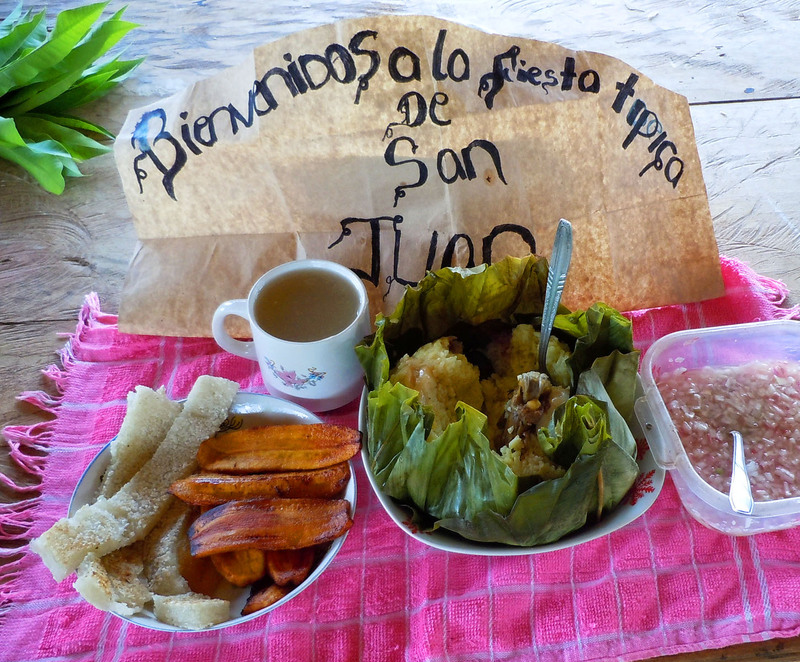 He then introduced all of the judges and dignitaries and explained that juane was the traditional provincial food associated with the festival of San Juan – an important day to mark here because it was a celebration dedicated to campesinos (rural people). My three fellow judges and I each then went to work. The director solemnly asked to rate each dish according to its presentation, contents and taste on a composite scale of 0 to 10. A few entries were very simple; they consisted of a juane formed in the shape of a giant Hershey’s kiss except it was a green banana leaf tied off at the top. Other entries included side dishes like cooked bananas, red onion sauce, and roasted macambo nuts. Unsure that I was an appropriate judge of a food I had not tasted in its authentic form, I nonetheless tried a spoonful of every item trusting that all of the hands that touched these many dishes had been clean. Most of the rice tasted about the same to me except for one batch that was too crunchy while a yellow batch had a nice spicy flavor (probably from being cooked with some guisador). My favorite entries had yummy plaintains and a fresh juice (“kawana”) made from aguaje fruit. Not wanting my uncultured vote to carry too much sway, I assigned scores ranging from 6 to 8. I recorded the scores of my fellow judges and was pleased or perhaps relieved that my relative scores matched theirs quite closely. I reported our results to the director who announced them with appropriate fanfare and awarded the top prize (3 large bottles of soda) to the winner of the primary and secondary school groups. After a few other people had spoken, he turned to me and asked if I would like to address the group. It wasn’t the finest impromptu speech ever delivered, but I thanked the group for the honor of serving as a judge at this important cultural event and hoped I could have some aguaje kawana later. After four or five more speeches (which were both sincere and blessedly brief), the director released us. I truly felt like a member of a jury who had just been thanked by a judge for their service to the community. Shortly after the juane competition was finished, many of the older kids returned to the field with their instruments including trumpets and both large and small drums. 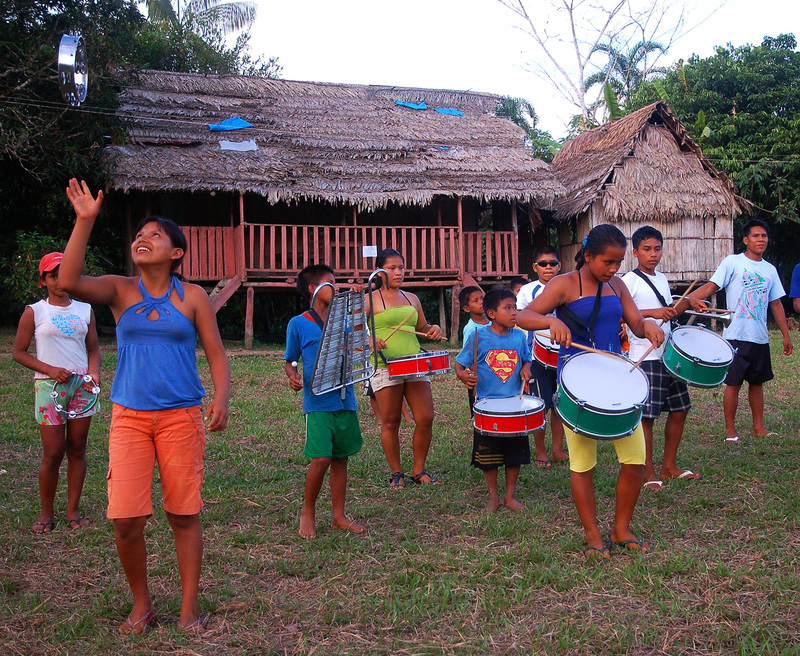 As they revved up the song they are going to play in a competition in Pebas on Peruvian Independence Day (July 28), they marched a bit to a cadence set by their leader and girls periodically tossed a tambourine into the air. I sincerely appreciated being asked to participate in a community event like the juane competition (even though I was recruited about 20 minutes before it started), but I couldn’t help thinking so much of the education offered in the village is geared toward building their identity and allegiance as citizens of Peru and Loreto with little or no teaching or recognition of them as unique indigenous people. It’s fortunate that most people in Brillo Nuevo still speak their native language, but as the influence of evangelical Christianity and consumerism becomes more and more ingrained in daily life here, the celebration of Bora festivals has become increasingly rare. Our friend Beder said he saw no conflict between the church and their traditions. It was the responsibility of the curaca to convene these festivals. While it is not unique to this particular culture, one of the things that I most appreciate about being in Brillo Nuevo is the strong sense of community here. There isn’t perfect social harmony, but day after day I’ve men and women gathering to play vigorous games of volleyball over threadbare nets strung on wooden poles. Kids love to play soccer almost any time they are not in school – particularly while it’s raining when they can slide for their body length in the mud. Family members are in and out of each other’s home all day long, and friends have seamless contact with each other as they wander from one end of the village to the other carrying water, share songs in church, or pass each other in their boats going fishing. Our life in a small city in the U.S. where social etiquette requires that parents call parents to arrange for their children to play together for two hours five days hence would seem unbearably strange to my friends here. 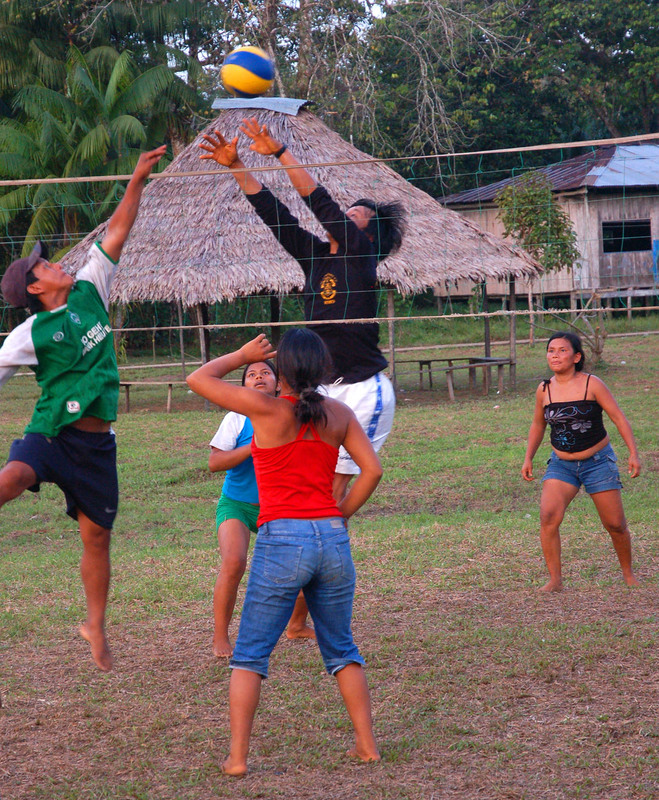 For more information about the Center for Amazon Community Ecology, please visit us on Facebook and our homepage at www.amazonecology.org.